I have created 4 lists (Pillar1, Pillar2, Pillar3, Pillar4), each one with same type of fields. Entries in each list are recreated in a master list (Transfers). Each entry in one of these lists has two unique fields, the ID field and the Grouping field (list one has Group1, list two has Group2, etc). 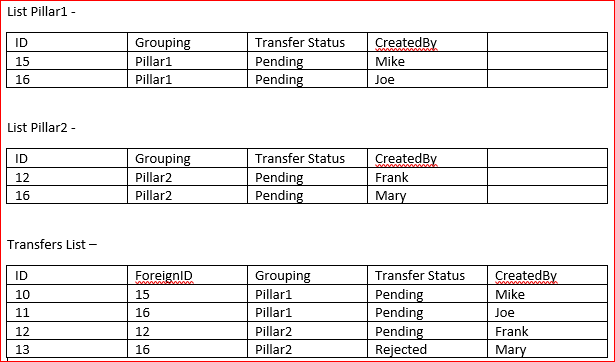 The ID field in each list is reflected in the Transfer list in column ForeignID while the Grouping column is listed as Grouping. Also a hidden field named Tranfer Status by default should be "Pending". 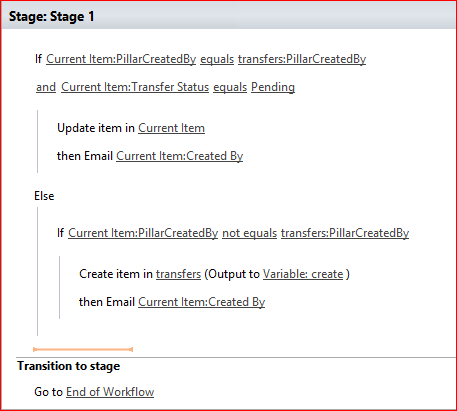 An entry in a Pillar is recreated in the Transfers list only if there are no other entry by the same user (CreatedBy) with Transfer Status "Pending".If an item by the same CreatedBy already exists with status "Pending" then do not create item in Transfers List and change the item status in the Pillar from "Pending" to "System Rejected". Now I need to update the Transfer Status of an entry in the Transfers List from Pending to Accepted or Rejected and this should reflect in the Original Pillar list it was created in. Unfortunately this workflow only updates list "Pillar1". I want to make the workflow to first check the column grouping and if it is Pillar1 then update list Pillar1 with unique ID , if Pillar 2 etc. This must be in combination with the Foreign Key in the Transfers List which is not unique in this list. The Foreign Key becomes unique in combination with the field Grouping. Browse other questions tagged list update merge or ask your own question. Can a workflow on one list update fields in a linked (joined) list? Link two SharePoint lists and edit at the same time where one list can have multiple items per one item on the source list?